I'm always amazed at food or recipes I've heard about for ages but never tried. Salt-cured salmon is one. It was much easier to prepare than I thought and the result was nothing short of wonderful. After two days of "curing" in the fridge, the thin slices of flavored salmon were silky and buttery. Now I feel even more venturesome to experiment with different flavors and liquors. "Gravlax" literally means "grave salmon." Fishermen would bury their salmon in the sand just above the high tideline. The salt in the sand would "cure" the salmon. 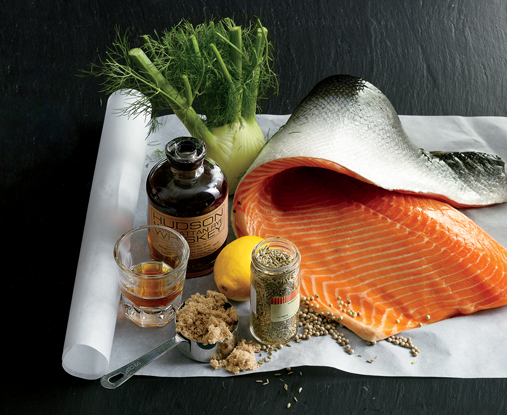 Dill is the preferred and standard herb to use when curing salmon. Along with "Aquavit," a Scandinavian liquor. This recipe, adapted from GQ, uses fresh fennel and whiskey. In the future, I could certainly imagine using flavored vodkas. Next time I prepare this particular recipe, I will add a grate or two of orange zest. This is a great appetizer, especially on a hot summer's day. The prep is pretty simple--season, wrap and wait. Two days later, unwrap, slice and enjoy! The delicate flavor of the cured fish is easy to lose with too many accoutrements. I prefer naked slices. But to be a bit fancy, I schmeared a bit of cream cheese on a plain water cracker followed by a razor-thin wafer of cucumber that I sliced with a vegetable peeler, a pinch of pepper and a few snips of chive. Lovely. For this recipe, I used a beautiful center-cut one- pound filet of Sockeye Salmon that my fishmonger, Brad, cut for me. It was thrillingly red and meaty. Lightly crush the fennel and caraway seeds. Set aside. In a medium bowl, mix together the "cure" of salt, sugar, lemon zest and fennel fronds. Measure a sheet of cling wrap 3 times as long as the width of the fish and spread on a baking sheet. Spread half of the salt/sugar mixture on the plastic wrap. Remove fish from refrigerator and place on top on cure mixture, skin-side down. Now pat down the remaining half of the salt/sugar mixture on top of the fish. Sprinkle seeds over the top and arrange the sliced fennel over the length of the fish. Sprinkle with pepper. When ready, remove fish from plastic wrap. Remove the fennel and rinse the cured fish under cold water. The fish will have "hardened." Pat dry. Using a sharp knife, cut thin slices on an angle. The skin will be tough as leather, but the flesh will be tender and succulent. Enjoy! Labels: Gravlax. How to salt cure salmon.